Corns are very common to horses' feet, a majority of all cases of lameness is due to this trouble. Corns are the result of shoes being allowed to stay on too long. The shoe, in such a case grows under the foot and presses on the sole and corns are formed. Even pressure of the shoe and sometimes too heavy bearing on the heel causes corns. Gravel wedging in under the shoe or between the bar and the wall is sometimes the cause of corns. Leaving the heel and quarters too high, whereby they will bend under and press against the sole, is another cause of corns. The seat of corns is generally in the sole of the foot at the quarter or heels between the bar and the wall, at the angle made by the wall and bar. Anything that will bruise the underlying and sensitive membrane of the sole will produce corn. This bruise gives rise to soreness; the sole becomes blood colored and reddish; if bad it might break out, either at the bottom or the junction of the hoof and hair or coronet, forming a quitter. Cut out the corn or red sole clear down. If the corn is the result of contraction pare down the hoof and sole, put the foot into linseed poultice that is warm, for twenty-four hours, then renew it. If the corn is deep, be sure to cut down enough to let the matter out. It is a good thing to pour into the hole hot pine tar. In shoeing the bearing should be taken off the quarter or from the wall over the corn by rasping it down so that it will not touch the shoe. A bar shoe is a good thing as it will not spring as much as to come in contact with the hoof over the corn. Give very little frog pressure. An open shoe can be used and in such a case there should be no calk at the heel. 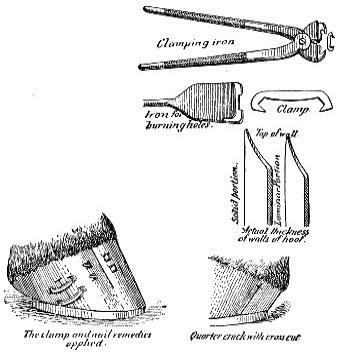 A calk should be welded on directly over the corn and the shoe will not spring up against the wall. Quarter and sand cracks are cracks in the hoof, usually running lengthwise of the fibers, but sometimes they will be running across the fiber for an inch or more. Quarter cracks are cracks mostly on the inside of the hoof, because that side is thinner and weaker than the outside. The cause of it is a hard and brittle hoof with no elasticity, brought on by poor assimilation and a want of good nutrition to the hoof. Hot, sandy or hard roads are also conducive to these cracks. What to do: If the horse is shod remove the shoes, and cut off the wall of the quarter to take off the bearing on both sides of the crack. If the crack goes up to the coronet and is deep, cut off both sides of the crack the whole length. About one inch below the coronet, cut a deep cut clear through either with a knife or hot sharp iron across the crack. This will help to start a new hoof. If the flesh sticks up between the cracks, let a veterinarian burn it off. In shoeing for this trouble, it is best to use a bar shoe (endless) and shoe the horse often. Get the Sonography Training you need to advance your career.